Objectives To develop and validate updated QRISK3 prediction algorithms to estimate the 10 year risk of cardiovascular disease in women and men accounting for potential new risk factors. Design Prospective open cohort study. Setting General practices in England providing data for the QResearch database. Participants 1309 QResearch general practices in England: 981 practices were used to develop the scores and a separate set of 328 practices were used to validate the scores. 7.89 million patients aged 25-84 years were in the derivation cohort and 2.67 million patients in the validation cohort. Patients were free of cardiovascular disease and not prescribed statins at baseline. Methods Cox proportional hazards models in the derivation cohort to derive separate risk equations in men and women for evaluation at 10 years. Risk factors considered included those already in QRISK2 (age, ethnicity, deprivation, systolic blood pressure, body mass index, total cholesterol: high density lipoprotein cholesterol ratio, smoking, family history of coronary heart disease in a first degree relative aged less than 60 years, type 1 diabetes, type 2 diabetes, treated hypertension, rheumatoid arthritis, atrial fibrillation, chronic kidney disease (stage 4 or 5)) and new risk factors (chronic kidney disease (stage 3, 4, or 5), a measure of systolic blood pressure variability (standard deviation of repeated measures), migraine, corticosteroids, systemic lupus erythematosus (SLE), atypical antipsychotics, severe mental illness, and HIV/AIDs). We also considered erectile dysfunction diagnosis or treatment in men. Measures of calibration and discrimination were determined in the validation cohort for men and women separately and for individual subgroups by age group, ethnicity, and baseline disease status. Main outcome measures Incident cardiovascular disease recorded on any of the following three linked data sources: general practice, mortality, or hospital admission records. Results 363 565 incident cases of cardiovascular disease were identified in the derivation cohort during follow-up arising from 50.8 million person years of observation. All new risk factors considered met the model inclusion criteria except for HIV/AIDS, which was not statistically significant. The models had good calibration and high levels of explained variation and discrimination. In women, the algorithm explained 59.6% of the variation in time to diagnosis of cardiovascular disease (R2, with higher values indicating more variation), and the D statistic was 2.48 and Harrell’s C statistic was 0.88 (both measures of discrimination, with higher values indicating better discrimination). The corresponding values for men were 54.8%, 2.26, and 0.86. Overall performance of the updated QRISK3 algorithms was similar to the QRISK2 algorithms. Conclusion Updated QRISK3 risk prediction models were developed and validated. The inclusion of additional clinical variables in QRISK3 (chronic kidney disease, a measure of systolic blood pressure variability (standard deviation of repeated measures), migraine, corticosteroids, SLE, atypical antipsychotics, severe mental illness, and erectile dysfunction) can help enable doctors to identify those at most risk of heart disease and stroke. QRISK2 is now used across England’s health service (NHS England) and recommended in the NHS Quality and Outcomes Framework,19 guidance from the National Institute of Health and Care Excellence,20 and NHS Health Check.21 QRISK2 is also used in occupational health settings and internationally, with over two million hits on the QRISK website (www.qrisk.org). A new NICE guideline on lipid modification and cardiovascular risk assessment was published in 2014.20 This guideline highlighted a number of conditions associated with increased cardiovascular risk that may not be fully captured by QRISK2, including HIV/AIDS, stage 3 kidney disease, systemic lupus erythematosus (SLE), severe mental illness, and use of atypical antipsychotics or corticosteroids.20 These conditions are not specifically identified within QRISK2, which may result in underestimation of risk in the relevant patient groups. In addition, recently published research has highlighted increased cardiovascular risk and potential prognostic importance for erectile dysfunction,22 23 24 migraine,25 and blood pressure variability.26 We therefore derived and validated a new version of the algorithms, QRISK3, to determine whether these factors should be incorporated into the algorithms to improve estimation of cardiovascular risk for these patients. Using the QResearch database (version 41) we undertook a cohort study in a large population of primary care patients. We included all practices in England that had been using the EMIS computer system for at least one year and randomly allocated three quarters of practices to the derivation dataset and the remainder to a validation dataset. We identified an open cohort of patients aged 25-84 years registered with the practices between 1 January 1998 and 31 December 2015. Patients were excluded if they had no postcode related Townsend score (since these usually result from patients moving to newly built houses with new postcodes not being yet linked to deprivation data or from patients being homeless or not having a permanent residence), had pre-existing cardiovascular disease (on general practice records or linked hospital records), or were using prescribed statins at cohort entry. We determined an entry date to the cohort for each patient, which was the latest of the following: 25th birthday, date of registration with the practice plus one year, date on which the practice computer system was installed plus one year, or the study start date (1 January 1998). Patients were censored at the earliest date of the diagnosis of cardiovascular disease, death, deregistration with the practice, last upload of computerised data, or study end date (31 December 2015). Our outcome was cardiovascular disease, which was defined as a composite outcome of coronary heart disease, ischaemic stroke, or transient ischaemic attack. The QResearch database is linked at individual patient level to hospital admissions data (Hospital Episode Statistics), and mortality records obtained from the Office for National Statistics. The records are linked using a pseudonymised NHS number specific to the QResearch database. The recording of NHS numbers is valid and complete for 99.8% of patients with data on QResearch, 99.9% for ONS mortality records, and 98% for hospital admissions records.3 27 We classified patients as having cardiovascular disease if there was a record of the relevant clinical code in either their general practice record, their linked hospital record, or their linked mortality record. We used Read codes to identify cardiovascular disease cases from the general practice record. The Read codes are listed in table 1⇓ of the web appendix. We used ICD-10 (international classification of diseases, 10th revision) clinical codes to identify cases from hospital and mortality records except for the three years between 1 January 1998 and 31 December 2000, when ICD-9 was in use for mortality records. The ICD-10 codes used were G45 (transient ischaemic attack and related syndromes), I20 (angina pectoris), I21 (acute myocardial infarction), I22 (subsequent myocardial infarction), I23 (complications after myocardial infarction), I24 (other acute ischaemic heart disease), I25 (chronic ischaemic heart disease), I63 (cerebral infarction), and I64 (stroke not specified as haemorrhage or infarction). The corresponding ICD-9 codes used were 410, 411, 412, 413, 414, 434, and 436. General practice and linked mortality and Hospital Episode Statistics data were available until 31 December 2015. We used the earliest recorded date of cardiovascular disease on any of the three data sources as the outcome date. We examined the predictor variables in box 1 based on established risk factors already included in the current version of QRISK2 and new candidate variables highlighted in the literature or National Institute for Health and Care Excellence guidelines. From the general practice record we extracted data for demographic factors, clinical diagnoses, and clinical values. For clinical values (systolic blood pressure and body mass index) and smoking status we obtained the most recent values recorded before the baseline date. We selected the closest value to cohort entry for total cholesterol: high density lipoprotein cholesterol ratio, restricting values after the baseline date to those before the patient had a diagnosis of cardiovascular disease or was censored, and before any statin prescriptions. To assess variability in systolic blood pressure, we identified all systolic blood pressure values recorded in the five years before study entry and calculated the standard deviation where there were two or more recorded values. Use of drugs at baseline was defined as at least two prescriptions, with the most recent one no more than 28 days before the date of entry to the cohort. All other predictor variables were based on the latest information recorded in the general practice record before entry to the cohort. We developed and validated the risk prediction algorithms using established methods1 5 8 10 28 and performed an initial analysis based on patients with complete variables. For our main analysis, we used multiple imputation with chained equations to replace missing values for body mass index, systolic blood pressure, standard deviation of systolic blood pressure, serum cholesterol, high density lipoprotein cholesterol, and smoking status and used these values in our main analyses.29 30 31 32 We log transformed values for continuous variables that were not normally distributed for inclusion in the imputation model so that the imputed values would better match the distribution of observed values. Five imputations were carried out as this has a relatively high efficiency33 and was a pragmatic approach accounting for the size of the datasets and capacity of the available servers and software. In the imputation model we included all predictor variables, along with age interaction terms, the Nelson-Aalen estimator of the baseline cumulative hazard, and the outcome indicator. Cox’s proportional hazards models were used to estimate the coefficients for each risk factor in women and men separately. We used Rubin’s rules to combine the results across the imputed datasets.34 Fractional polynomials35 were used to model non-linear risk relations with continuous variables using data from patients with recorded values to derive the fractional polynomial terms. We fitted full models initially. For consistency, we included variables from existing QRISK2 models and then retained additional variables if they had an adjusted hazard ratio of less than 0.90 or greater than 1.10 (for binary variables) and were statistically significant at the 0.01 level. We developed three main models. Model A contains the same variables as the latest version of QRISK2-2017. Model B includes the additional variables that met our inclusion criteria but not the standard deviation of serial systolic blood pressure values. Model C is the same as model B except that it includes the standard deviation of serial systolic blood pressure values. We examined interactions between new predictor variables and age at study entry and included significant interactions in models B and C along with interactions already included in QRISK2. From the final models we used the regression coefficients for each variable as weights, which we combined with the baseline survivor function evaluated up to 15 years to derive risk equations over a period of 15 years of follow-up.36 This enabled us to derive risk estimates for each year of follow-up, with a specific focus on 10 year risk estimates. We estimated the baseline survivor function based on zero values of centred continuous variables, with all binary predictor values set to zero. In the validation cohort we used multiple imputation to replace missing values for body mass index, systolic blood pressure, standard deviation of systolic blood pressure, serum cholesterol, high density lipoprotein cholesterol, and smoking status. We carried out five imputations. The risk equations for women and men obtained from the derivation cohort for models A, B, and C were applied to the validation cohort and measures of discrimination calculated. As in previous studies,4 we calculated R2 values (explained variation where higher values indicate a greater proportion of variation in time to cardiovascular disease diagnosis is explained by the model 37), D statistic38 (a measure of discrimination where higher values indicate better discrimination), and Harrell’s C statistic at 10 years and combined these across datasets using Rubin’s rules. Harrell’s C statistic39 is a measure of discrimination that is similar to the area under a receiver operating characteristic curve but takes account of the censored nature of the data. In line with current NICE guidelines,20 we classified patients as being at high risk of cardiovascular disease if their 10 year risk was 10% or greater. We compared predicted risks for our final models (QRISK3) with the latest version of QRISK2-2017 to determine the percentage of patients who would be reclassified at this threshold according to each model. Among the reclassified patients we also calculated the observed risks of cardiovascular disease at 10 years using the Kaplan-Meier method. Over the past 10 years since the original publication of QRISK1 there has been extensive discussion about methods for assessment of cardiovascular risk. This has included a series of public stakeholder consultations in relation to updates of NICE guidance on lipid modification,20 the NHS Quality and Outcomes Framework, and NHS Health Check.21 We therefore decided to focus on issues highlighted in NICE guidance and the literature rather than to consult patient or professional groups. We decided it would be more transparent and effective to discuss the addition of new variables once the paper was published and the relative contribution of individual risk factors had been quantified. Given the widespread implementation of QRISK2 across the NHS and its inclusion in guidelines, this would give time for feedback from a range of stakeholders (including patient groups and charities) as to which changes would be most beneficial and how improvements might be implemented. Overall, 1309 practices contributing to the QResearch database in England met our inclusion criteria. Of these, 981 were randomly assigned to the derivation dataset and the remainder (n=328) to a validation cohort. 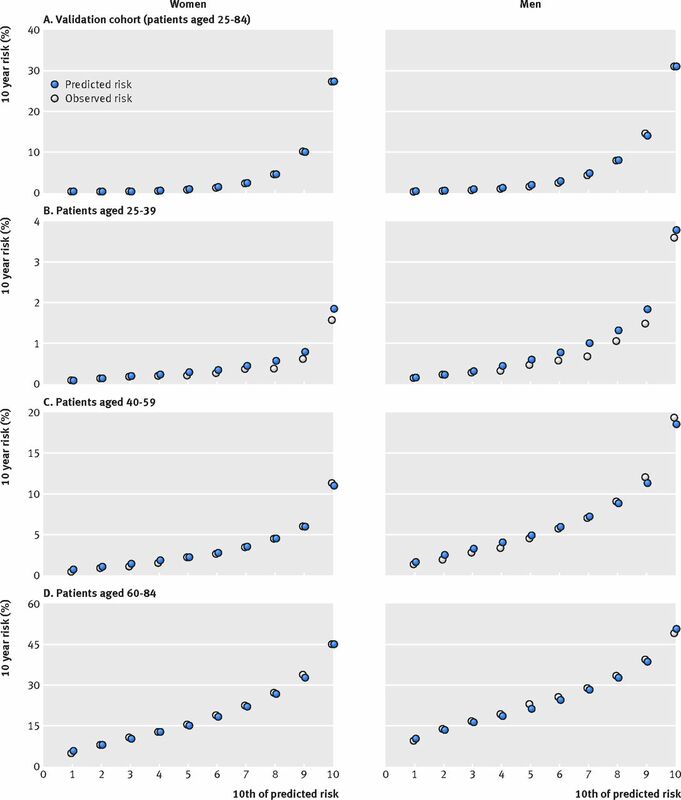 For the derivation cohort we identified 8 602 833 patients aged 25-84 years. We excluded 31 433 (0.4%) with no recorded Townsend score, 344 669 (4.0%) with a diagnosis of cardiovascular disease at baseline recorded on the general practice or Hospital Episode Statistics record, and 336 928 (3.9%) prescribed statins at baseline. Overall, 7 889 803 patients were included in the derivation analysis. For the validation cohort we identified 2 918 082 patients aged 25-84 years. We excluded 13 862 (0.5%) with no recorded Townsend score, 118 057 (4.0%) with a diagnosis of cardiovascular disease recorded on the general practice or Hospital Episode Statistics record, and 114 865 (3.9%) prescribed statins at baseline. In total, 2 671 298 patients were included in the validation analysis. Table 1⇑ shows the baseline characteristics of men and women in the derivation and validation cohorts. In the derivation cohort, self assigned ethnic origin was recorded for 64.9% of women and 59.7% of men, smoking status for 85.0% and 77.7%, respectively, systolic blood pressure for 82.8% and 68.3%, respectively, body mass index for 72.8% and 64.0%, respectively, and total cholesterol: high density lipoprotein cholesterol ratio for 39.8% and 37.9%, respectively. Complete information for smoking status, systolic blood pressure, body mass index, and total cholesterol: high density lipoprotein cholesterol ratio was provided for 28.5% of women and 24.6% of men. At least two systolic blood pressures were recorded for 77.7% of women and 64.0% of men from which the standard deviations were calculated. These values were similar to corresponding values for both sexes in the validation cohort (table 1⇑). Table 1⇑ also shows comorbidities at study entry. For the new variables of interest, severe mental illness was recorded for 6.8% of women and 4.3% of men, migraine for 6.4% and 2.7%, respectively, chronic kidney disease (stage 3, 4, or 5) for 0.5% and 0.3%, respectively; prescribed atypical antipsychotics for 0.5% of women and men, and prescribed corticosteroids for 2.4% and 1.5%, respectively, and 2.3% of men had a diagnosis of or treatment for erectile dysfunction. SLE was recorded for 0.1% of women and less than 0.1% of men and HIV/AIDS for 0.1% of women and 0.2% of men. The mean of the most recent systolic blood pressure values was 123.2 mm Hg in women and 129.2 mm Hg in men and the mean of the standard deviations of repeated systolic blood pressure values was 9.3 in women and 9.9 in men. Table 2⇓ shows the numbers of patients with a new diagnosis of cardiovascular disease during follow-up by age group (five year intervals) in women and men in the derivation cohort based on the linked general practice, hospital, and Office for National Statistics morality records. In the derivation cohort, we identified 363 565 incident cases of cardiovascular disease arising from 50.8 million person years of observation. The incidence of cardiovascular disease increased steeply by age group and values were higher in men than women for all age groups. Table 2⇓ in the web appendix shows a similar breakdown by nine ethnic groups. For example, 4758 events occurred in Indian women and men arising from 8 819 177 person years of observation and 417 events in Chinese women and men arising from 210 267 person years of observation. Table 3⇓ in the web appendix shows the source of the data that first identified the incident event by type of event in the derivation cohort. It also shows the number and percentage of cases that were identified only using general practice data with no subsequent evidence of cardiovascular disease on hospital or mortality records. Of the 363 565 incident events, 78 327 (21.5%) were myocardial infarction, 152 141 (41.8%) were angina, 49 504 (13.6%) were transient ischaemic attack, and 83 593 (23.0%) were ischaemic strokes. Overall, 92 936 (25.6% of all 363 565 events) were only recorded on the general practice record, with the most common condition being transient ischaemic attack (27 227 events). The median follow-up in the derivation cohort was 4.4 years (interquartile range 1.6-10.8) and 2 141 841 patients had 10 years or more of follow-up and 1 090 704 had 15 years or more of follow-up. Of the 7 889 803 patients in the derivation cohort, 696 387 (8.8%) started using statins after entry to the cohort and before having a new diagnosis of cardiovascular disease or being censored. Of the 50 764 868 person years of follow-up, 46 940 777 person years were free from statin use (92.5%). In the validation cohort, the median follow up was 4.4 years (interquartile range 1.6-10.8) and 728 704 patients had 10 years or more of follow-up and 380 387 had 15 years or more of follow-up. Table 3⇑ shows the adjusted hazard ratios for women in the derivation cohort and table 4⇓ shows the corresponding values for men. Of the new risk factors, all met our model inclusion criteria except for HIV/AIDS, which was associated with a 25% increased risk in women and 17% increased risk in men, but these were not statistically significant at the 0.01 level. Model A is the latest version of QRISK2 (2017). Model B includes the additional variables that met our inclusion criteria. Model C is the same as model B except that it includes the standard deviation of serial systolic blood pressure values. The supplementary figure shows graphs of the adjusted hazard ratios for model B for the fractional polynomial terms for age and body mass index as well as the interaction terms between age and relevant predictor variables, as listed in the footnotes of tables 3 and 4⇓. For the new variables of interest in model B, migraine was associated with a 36% increased risk of cardiovascular disease for women and a 29% increased risk for men, corticosteroids were associated with an 82% increased risk for women and 58% increased risk for men, SLE was associated with a 115% increased risk for women and a 55% increased risk for men, atypical antipsychotics were associated with a 29% increased risk for women and a 15% increased risk for men, severe mental illness was associated with a 14% increased risk for women and a 13% increased risk for men. Erectile dysfunction was associated with a 25% increased risk. Where there were age interactions these values relate to risks evaluated at the mean ages. The full list of age interactions is shown in the footnotes for tables 3 and 4⇓. For the new variables, there were statistically significant interactions between age and migraine as well as age and corticosteroid use in both sexes. In women, there was also a statistically significant interaction between age and SLE. In men, there was also a statistically significant interaction between age and erectile dysfunction. For each of these interactions, hazard ratios for the predictors were higher at younger ages compared with older ages, except for erectile dysfunction in men, where hazard ratios were highest for men aged around age 45 and then declined gradually with increasing age. For model C, the standard deviation of systolic blood pressure values was included in the model in addition to the single most recent systolic blood pressure value. Overall a 10 unit increase in the standard deviation of systolic blood pressure was associated with an 8% increased risk of cardiovascular disease in women (table 3⇑) and an 11% increased risk in men (table 4⇑). Tables 4 and 5⇓ in the web appendix show the results of complete case analyses for models B and C for women and men, respectively (ie, the results based on patients with complete data). The hazard ratios associated with total cholesterol: high density lipoprotein cholesterol ratio, systolic blood pressure, and standard deviation of systolic blood pressure were similar to those obtained in the main models using multiply imputed data. Table 5⇑ shows the performance of each algorithm in the validation cohort for women and men for each of models A, B, and C. For model B in women, the algorithm explained 59.5% of the variation in time to diagnosis of cardiovascular disease (R2), the D statistic was 2.48, and the Harrell’s C statistic was 0.88. The corresponding values for men were 54.8%, 2.26, and 0.86. Measures of performance were similar for all three models. Table 6⇓ in the web appendix shows the validation statistics for model B in various subgroups, including three age groups, ethnic groups, and in those with specific comorbidities. The highest performance values by ethnic origin were in Chinese women (R2=64.7%; D=2.77; Harrell’s C=0.91) and the lowest values were in Caribbean women (R2=51.6%; D=2.11; Harrell’s C=0.85). Performance values were highest in the youngest age group (25-39 years) and lowest in the oldest age group (60-84 years). For the subgroup of women with type 1 diabetes the R2 was 47.3%, D statistic was 1.94, and Harrell’s C statistic was 0.82. The corresponding values for men with type 1 diabetes were 45.6%, 1.87, and 0.80. For the subgroup of women with type 2 diabetes the R2 was 25.2%, D statistic was 1.19, and Harrell’s C statistic was 0.70. The corresponding values for men with type 2 diabetes were 22.9%, 1.12, and 0.70. Figure 1⇓ shows the funnel plots of Harrell’s C statistic for model B across the 328 practices in the validation cohort. The funnel plots show Harrell’s C statistic for each general practice versus the number of cardiovascular events in each practice in women and men separately. Practices with fewer cardiovascular events had wider variation in the C statistic than practices with more events. The summary (average) C statistic for women was 0.874 (95% confidence interval 0.869 to 0.880) from a random effects meta-analysis. The I2 value (ie, the percentage of total variation in C statistics owing to between practice heterogeneity) was 93.3%. The approximate 95% prediction interval for the true C statistic in women in a new practice was 0.79 to 0.96. The summary C statistic for men was 0.851 (95% confidence interval, 0.847 to 0.855) from a random effects meta-analysis. The I2 value was 84.2%. The approximate 95% prediction interval for the true C statistic in men in a new practice was 0.79 to 0.91. In women, the mean 10 year predicted risk was 4.7% for models A, B, and C. The observed 10 year risk was 5.8% (95% confidence interval 5.8% to 5.9%). In men, the mean 10 year predicted risk was 6.4% for models A, B, and C. The observed 10 year risk was 7.5% (7.5% to 7.6%). Figure 2⇓ shows the mean predicted risks and observed risks at 10 years by 10th of predicted risk, applying each algorithm to all women and men in the validation cohort and to separate age groups (25-39, 40-59, and 60-84 years). There was close correspondence between the mean predicted risks and the observed risks within each model 10th overall and in each age group in women and men indicating that the algorithms were well calibrated. The exception was in those aged 25-39 where mean predicted risks were slightly higher than observed risks. Overall, there were 2 671 298 patients in the validation cohort. Of these, 458 263 (17.2%) had a 10 year risk score of 10% or greater using model A; 458 869 (17.2%) using model B, and 458 868 (17.2%) using model C.
Using model A, the number of patients with a 10 year risk score of 15% or more was 308 130 (11.5%) and with a risk of 20% of more was 214 451 (8.0%). The corresponding numbers for models B and C were similar. Of 458 263 patients with a 10 year predicted risk score of 10% or more using model A, 10 948 (2.4%) would be reclassified as low risk (predicted risk <10% over 10 years) using model B. The 10 year observed risk among these reclassified patients was 10.3% (95% confidence interval 9.6% to 11.1%), just above the 10% threshold. Conversely, of the 2 213 035 classified as low risk (predicted risk <10% over 10 years) using model A, 11 554 (0.5%) would be reclassified as high risk using model B. The 10 year observed risk among these reclassified patients was 12.2% (11.4% to 13.1%), above the 10% threshold. Of the 458 869 patients with a 10 year predicted risk score of 10% or more using model B, 9102 (2.0%) would be reclassified as low risk using model C. The 10 year observed risk among these reclassified patients was 9.6% (95% confidence interval 8.9% to 10.5%), marginally below the 10% threshold. Conversely, of the 2 213 429 with a 10 year predicted risk score of less than 10% using model B, 9101 (2.4%) would be reclassified as high risk using model C. The 10 year observed risk among these reclassified patients was 10.7% (9.9% to 11.6%), marginally above the 10% threshold. Table 6⇑ shows clinical examples where use of model A, B, or C would result in a reclassification above or below the 10% threshold. Figures 3⇓ and 4⇓ show screenshots of the updated web calculator with a clinical example which can be found at www.qrisk.org. We have developed and validated updated algorithms (QRISK3) to predict 10 year risk of cardiovascular disease in women and men aged 25-84 years. The algorithms incorporate established predictor variables from QRISK2 as well as new variables associated with increased risk of cardiovascular disease. These include an expanded definition of chronic kidney disease to include chronic kidney disease stage 3, migraine, corticosteroid use, systemic lupus erythematosus (SLE), atypical antipsychotic use, severe mental illness, erectile dysfunction, and a measure of blood pressure variability (standard deviation of repeated values). We have produced three main final models: model A, which includes the same variables and coefficients as the current version of QRISK2-2017; model B, which includes the new variables and the latest systolic blood pressure value and is for use where only the current reading is available; and our preferred model C, which additionally includes a measure of blood pressure variability that may be more suitable for integration into general practice computer systems where longitudinal repeated values are likely to be available. Although in population terms the overall performance of all three models is similar, for those who have one or more of the conditions included in the newer models, having the additional risk taken into account could result in the difference between taking or not taking risk reducing treatment. The increased complexity is unlikely to affect the take-up of the new models as they are designed to be calculated automatically from the electronic patient record. Sufficient pathophysiological and epidemiological evidence have now accumulated for some experts to propose that migraine should be included as a marker for future cardiovascular disease.41 Our results support this since we found that migraine was associated with a 36% increased risk of cardiovascular disease for women and 29% for men (model B). This is consistent with the increased risk of 42% in 27 840 women aged 45 and over in the Women’s Health Study42 and the increased risk of 50% reported in a recent study of 115 541 women aged 25-42 recruited to the Nurses’ Health Study II.25 In our study, migraine was recorded in 6.4% of women and 2.7% of men. This is less than the 16% reported in the Nurse’s Health Study II25 and the 18.4% in the Women’s Health Study42 and might reflect differences in cohort selection, clinical setting, consulting patterns, diagnostic criteria, or recording of diagnoses. For example, our study is based on routinely collected health records and uses diagnoses recorded by clinicians before entry to the cohort. In contrast, the Nurses’ Health Study II used self report questionnaires at three time points over a six year period. Our study, which also includes men, is much larger than previous studies.25 42 While our study may be more representative of the general population than patients recruited to a trial, it is also susceptible to ascertainment bias. This would be the case if not all patients with migraine visited their general practitioner and not all of those diagnoses are recorded. Conversely, the Nurses’ Health Study II and the Women’s Health Study may be subject to recall bias owing to the use of self reported questionnaires inquiring about historical diagnoses. Also, our definition of migraine included a range of subtypes so it is not possible to say which of these are associated with the additional risk of being categorised as having migraine. For example, the bulk of the risk could be coming from those with migraine with aura rather than other subtypes.43 While the magnitude of the increased risk associated with migraine is relatively small at the individual level, it is important at the population level since migraine is so prevalent.41 Hence there is good justification for including clinician recorded diagnosed migraine in our new models. The National Institute for Health and Care Excellence guidance states that cardiovascular disease risk scores will underestimate cardiovascular risk among people who are taking medicines that cause dyslipidaemia such as antipsychotic drugs or corticosteroids.20 In line with other studies,44 we found evidence to support the increased risk with corticosteroids despite simultaneous adjustment of lipid levels. 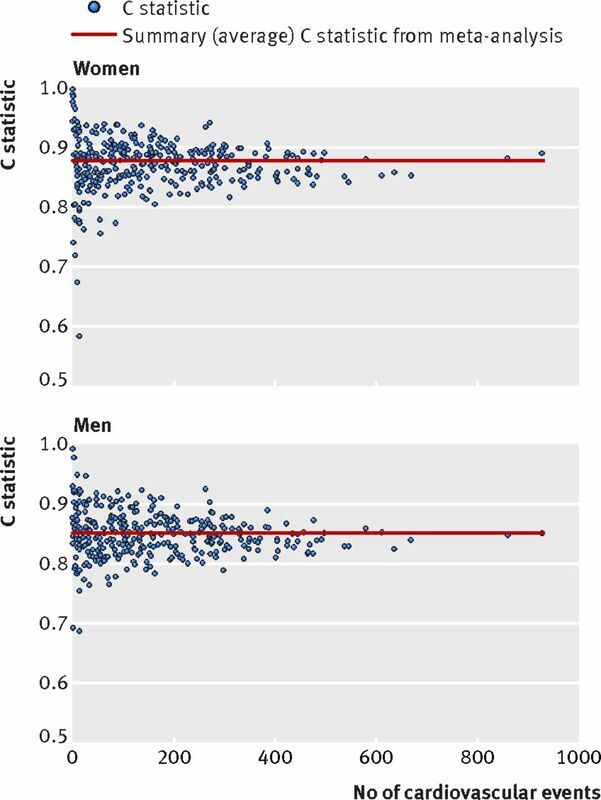 Current corticosteroids (defined as ≥2 prescriptions, with the most recent one within the 28 days before study entry) were prescribed for 2.4% of women and 1.5% of men and were associated with an 82% increased cardiovascular risk in women and 58% increased risk in men. This is similar to the increased risks with corticosteroids found in other studies.45 46 However, our definition was relatively simple (and could be used in clinical practice) but did not account for duration of use and dose and so allows for substantial heterogeneity in the indications for steroid use, and the effect may not apply equally to those with different levels of exposure. Similarly, atypical antipsychotic drugs were prescribed to 0.5% of men and women and were associated with a 29% increased cardiovascular risk in women and 15% increased risk in men. Both corticosteroids and atypical antipsychotics therefore seem to be clinically important variables to include in QRISK, taking account of the magnitude of the risk and the potential numbers of patients affected. The NICE guidance highlights the increased cardiovascular risk associated with severe mental illness,20 although this is contrary to a recent systematic review and meta-analysis, which failed to find sufficient evidence to support this conclusion.47 Our study found that 6.8% of women and 4.3% of men had a diagnosis of severe mental illness affects and it was associated with a 14% increased risk of cardiovascular disease for women and a 13% increased risk for men (model B). This is independent of the risk associated with atypical antipsychotics and hence both factors have been included separately as they will have a compound effect on cardiovascular risk. Clinicians will now be able to provide better information to these patients both about interventions to reduce cardiovascular risk and about the potential effects of atypical antipsychotics. The NICE guidance20 states “do not use a risk assessment tool in people with an estimated glomerular filtration rate (eGFR) of less than 60/mL/1.73 m2 and/or albuminuria. These people are at increased risk of cardiovascular disease . . . Atorvastatin should be offered to people with CKD [chronic kidney disease].” Our expanded definition of chronic kidney disease now includes chronic kidney disease stage 3 (eGFR 30-59/mL/1.73 m2) in addition to stages 4 and 5, in line with other published studies.49 This means QRISK3 can be used in such patients and will provide them with better information to inform their choice about use of statins and potentially other non-drug interventions to reduce their cardiovascular risk and to “encourage the person to participate in reducing their risk” in line with the recommendations for other patients. Although the NICE guidance on lipid modification20 recommends the use of QRISK2 in patients with type 2 diabetes, it states “do not use a risk assessment tool to assess CVD [cardiovascular disease] risk in patients with type 1 diabetes.” Instead it recommends that “statin treatment is offered to all patients with type 1 diabetes who are older than 40 years or have had diabetes for more than 10 years or have established nephropathy or have other CVD risk factors.” The current model for QRISK2 and the models presented in this paper allow calculation of cardiovascular risk for patients with type 1 diabetes. The performance among patients with type 1 diabetes is good (see table 6⇑ in the web appendix). We can see no reason why patients with type 1 diabetes should not have similar discussions to other patients regarding the risks and benefits of interventions. Use of the calculator in patients with type 1 diabetes is intended to allow better information to be shared with such patients on their cardiovascular risk profile. It may identify patients with a risk under 10% who may not want to take statins as well as facilitate a discussion on a range of interventions to reduce risk, including weight loss, blood pressure control, and smoking cessation. The performance of the models in patients with type 2 diabetes was lower than for patients with type 1 diabetes (for example in men with type 2 diabetes Harrell’s C=0.70, R2=22.9% compared with Harrell’s C=0.80, R2=45.6% in men with type 1 diabetes). Recent studies have suggested that higher blood pressure variability is associated with increased risks of stroke26 and other cardiovascular events.50 This may be independent of mean blood pressure values,50 although the increased risk of cardiovascular events associated with blood pressure variability in the recent meta-analysis by Stevens et al was based on one study of 8811 patients aged more than 55 years with type 2 diabetes.51 In our study, both the most recent value at baseline and the standard deviation of systolic blood pressure were independently associated with increased risk of cardiovascular disease, although the addition of the standard deviation to the model did not improve discrimination or calibration. It may be difficult to implement the model with blood pressure variability in a setting where there is no historical information on blood pressure available, such as with a web calculator. While the performance and reclassification statistics suggest that its inclusion will not make a major difference at a population level, there may be some benefit from taking this factor into account for those patients with highly variable blood pressure. The true prevalence of erectile dysfunction is difficult to determine, and estimates range from 1% to 100% depending on the age of the population and how the diagnosis was made.24 Our study indicated that erectile dysfunction affected 2.3% of men, but this is likely to be an underestimate as it includes only men who present to their doctor with the condition and have the diagnosis or treatment recorded on their electronic record. We showed that erectile dysfunction is likely to be an independent risk factor for cardiovascular disease and was associated with a 25% increased risk of cardiovascular disease (at the mean age), which is compatible with the findings of a meta-analysis that examined the association between erectile dysfunction and cardiovascular disease risk in 13 studies.23 While the overall relative risk estimate from these studies was 1.44, the 95% confidence interval was broad (1.27 to 1.63) and there was substantial heterogeneity across the studies. The association was reduced to 1.34 (1.17 to 1.54) when only high quality studies were included. Our definition and others only provide a summary effect and it should be recognised that the causes of erectile dysfunction are usually a combination of the physiological and psychological and that men with vascular causes are likely to be at higher risk of cardiovascular disease than those for whom the cause is largely psychological. Data from large cohorts have reported that people infected with HIV have approximately 50% greater risk of acute myocardial infarction and stroke compared with those without HIV,52 which may be related to antiretroviral treatment.53 While we found a tendency towards an increased risk of cardiovascular disease among people with HIV/AIDS this did not reach statistical significance at the 0.01 level so was not included in the final models. These results may reflect the relatively small numbers with HIV/AIDS recorded on the general practice clinical system. Also, people with HIV/AIDS tend to be younger and so have low absolute event rates and shorter periods of follow-up with an individual general practice, which may tend to underestimate the long term association. People with HIV/AIDS may receive healthcare (and prescriptions for antiretroviral treatment) from specialist clinics rather than general practices, which may explain why there are few prescriptions recorded for antiretroviral treatment on the QResearch database. Over time the recording of HIV/AIDS and prescribing of antiretroviral treatment may increase and so it is important to reassess the suitability of HIV/AIDS for inclusion in QRISK3 periodically to ensure that affected people have accurate cardiovascular risk assessments. Our new models are well calibrated when applied to a separate validation cohort and have high levels of discrimination. We found an improvement in performance from all three models over the original version of QRISK2 from 2008,28 although some of this improvement is likely to be owing to the wider age range (25-84 compared with 35-74 years). Since 2008, improvements have been made to the underlying QResearch database used to derive the QRISK algorithm, which may have resulted in improvements to the performance of the algorithm over and above extending the age range from 35-74 to 25-84 years and the inclusion of additional variables. Ascertainment of cardiovascular events has improved with the linkage of the QResearch database to both Office for National Statistics mortality and Hospital Episode Statistics since 1998. The number of practices contributing to the database has more than doubled, from 531 in 2008 to over 1300. The size of the derivation cohort has increased fivefold, with 363 565 cardiovascular events arising from 50.8 million person years of observation compared with 96 709 events arising from 10.9 million person years in 2008. The recording of self assigned ethnic origin has increased; 25% in 2008 compared with 62% in the current derivation cohort. As a result of these factors, there are many more events within each ethnic group—for example, there has been a 10-fold increase in the number of cardiovascular events for non-white ethnic groups compared with 2008. This is reflected in the more accurate hazard ratios with tighter confidence intervals and improved performance statistics. The methods used to derive and validate these models are broadly the same as for a range of other clinical risk prediction tools derived from the QResearch database.28 54 55 56 57 The strengths and limitations of the approach have already been discussed in detail.8 54 57 58 59 60 In summary, key strengths include size, duration of follow up, representativeness, and lack of selection, recall, and respondent bias. UK general practices have good levels of accuracy and completeness in recording clinical diagnoses and prescribed drugs.61 We think our study has good face validity since it has been conducted in the setting where most patients in the UK are assessed, treated, and followed up. Limitations of our study include the lack of formal adjudication of diagnoses, information bias, and potential for bias owing to missing data. Our database has linked hospital and mortality records for nearly all patients and is therefore likely to have picked up the majority of cardiovascular events thereby minimising ascertainment bias. We excluded patients using statins at baseline as in previous versions of QRISK and QRISK2. Over the past decade a change in guidelines will have led to a higher proportion of at risk patients being prescribed statins in the absence of established cardiovascular disease. Removing patients at high risk will tend to lower overall event rates. We excluded patients without a valid deprivation score since this group may represent a more transient population, where follow-up could be unreliable or unrepresentative. Their deprivation scores are unlikely to be missing at random so we did not think it would be appropriate to impute them. Given the number tested for inclusion, there may be some over fitting of interaction terms. We have continued to use the well recognised total cholesterol: high density lipoprotein cholesterol ratio as a predictor rather than low density lipoprotein cholesterol values alone as the ratio resulted in improved prediction during earlier versions of QRISK and QRISK2 and is measured directly, whereas low density lipoprotein cholesterol is calculated. The present validation has been done on a separate set of practices and individuals to those that were used to develop the score, although the practices all use the same general practice clinical computer system (EMIS, used by 55% of UK general practices). An independent validation study would be a more stringent test and should be done, but when such independent studies have examined QRISK2 and other risk algorithms,6 7 59 60 they have shown comparable performance compared with the validation in the QResearch database.28 54 58 We have published the source code to enable accurate implementation of QRISK3 on the QRISK website (www.qrisk.org) with earlier versions of the score from previous annual updates. The rationale for this is to ensure that those interested in reviewing or using the open source will then be able to find the current version as the score continues to be updated. 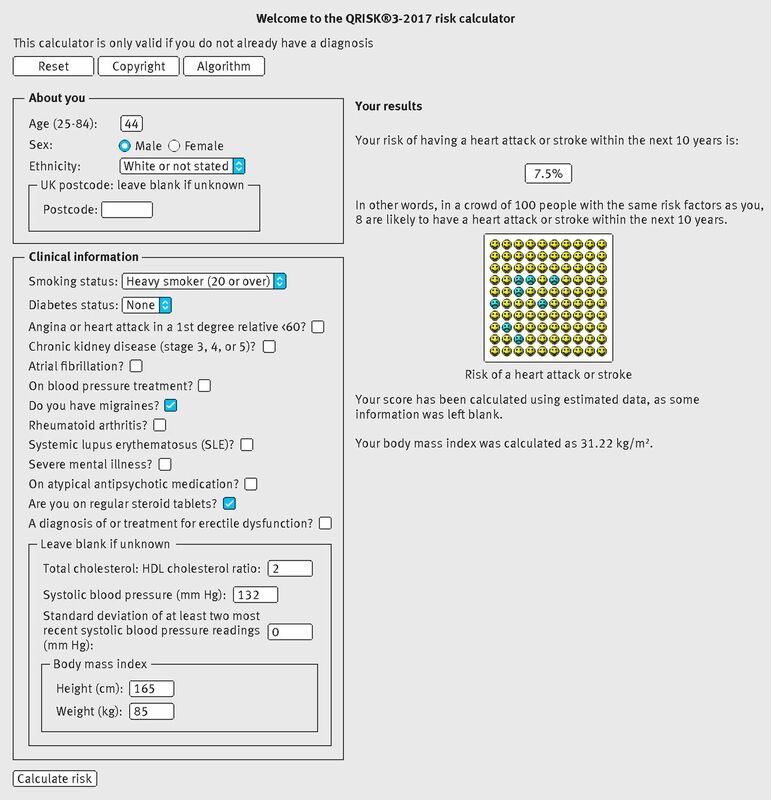 We have developed updated algorithms (QRISK3) to quantify absolute risks of cardiovascular disease in people aged 25-84 years, which include established risk factors and new risk factors: expanded definition of chronic kidney disease (stage 3, 4, or 5), migraine, corticosteroid use, SLE, atypical antipsychotic use, severe mental illness, erectile dysfunction, and a measure of blood pressure variability (standard deviation of repeated measures). The updated risk algorithms provide valid measures of absolute risk in the general population of patients, as shown by the performance in a separate validation cohort. A simple web calculator to implement the QRISK3 algorithms can be accessed at www.qrisk.org/Open source software is also available for download. We thank the EMIS practices that contribute to QResearch, and EMIS and the University of Nottingham for expertise in establishing, developing, and supporting the QResearch database, and the Office for National Statistics for providing the mortality data. The Hospital Episode Statistics data in this analysis are reused by permission from NHS Digital, which retains the copyright. ONS and NHS Digital bear no responsibility for the analysis or interpretation of the data. Contributors: JHC initiated the study, developed the research question, undertook the literature review, extracted and manipulated the data, performed the primary data analysis, and wrote the first draft of the paper. CC contributed to the refinement of the research question, design, analysis, interpretation, and drafting of the paper. PB contributed to the development of the research question, design, interpretation, and drafting of the paper. Funding: No external funding was received for this study. Competing interests: All authors have completed the ICMJE uniform disclosure form at www.icmje.org/coi_disclosure.pdf and declare: JHC is professor of clinical epidemiology at the University of Nottingham and codirector of QResearch a not-for-profit organisation that is a joint partnership between the University of Nottingham and Egton Medical Information Systems (leading commercial supplier of IT for 55% of general practices in the UK). JHC is also a paid director of ClinRisk, which produces open and closed source software to ensure the reliable and updatable implementation of clinical risk algorithms within clinical computer systems to help improve patient care. CC is associate professor of medical statistics at the University of Nottingham and a paid consultant statistician for ClinRisk. PB is partly funded by Health Research Collaboration for Leadership in Applied Health Research and Care West (NIHR CLAHRC West), Bristol Clinical Commissioning Group and the West of England Academic Health Science Network.. This work and any views expressed within it are solely those of the authors and not of any affiliated bodies or organisations. Ethical approval: The study was reviewed in accordance with the QResearch agreement with East Midlands-Derby Research Ethics Committee (reference 03/4/021). Data sharing: The algorithms presented in this paper will be released as open source software under the GNU lesser GPL v3. The open source software allows use without charge under the terms of the GNU lesser public license version 3. Closed source software can be licensed at a fee. Transparency: The lead author (JHC) affirms that the manuscript is an honest, accurate, and transparent account of the study being reported; that no important aspects of the study have been omitted; and that any discrepancies from the study as planned (and, if relevant, registered) have been explained. This is an Open Access article distributed in accordance with the Creative Commons Attribution Non Commercial (CC BY 4.0) license, which permits others to distribute, remix, adapt, build upon this work non-commercially, and license their derivative works on different terms, provided the original work is properly cited and the use is non-commercial. See: http://creativecommons.org/licenses/by-nc/4.0/. Hippisley-Cox J, Coupland C, Vinogradova Y, Robson J, May M, Brindle P. Derivation and validation of QRISK, a new cardiovascular disease risk score for the United Kingdom: prospective open cohort study. BMJ2007;335:136. doi:10.1136/bmj.39261.471806.55. pmid:17615182. Hippisley-Cox J, Coupland C. QRISK2. Annual Update Information2016;2016:5. Hippisley-Cox J. Validity and completeness of the NHS Number in primary and secondary care electronic data in England 1991-2013. 2013; 1. Hippisley-Cox J. Validity and completeness of the NHS number in primary and secondary care: electronic data in England 1991-2013 http://eprints.nottingham.ac.uk/3153/1/Validity%26CompletenessNHSNumber.pdf (accessed June 2013). Hippisley-Cox J, Coupland C, Brindle P. The performance of seven QPrediction risk scores in an independent external sample of patients from general practice: a validation study. BMJ Open2014;4:e005809. doi:10.1136/bmjopen-2014-005809 pmid:25168040. Collins GS, Altman DG. An independent external validation and evaluation of QRISK cardiovascular risk prediction: a prospective open cohort study. BMJ2009;339:b2584. doi:10.1136/bmj.b2584 pmid:19584409. Collins GS, Altman DG. An independent and external validation of QRISK2 cardiovascular disease risk score: a prospective open cohort study. BMJ2010;340:c2442. doi:10.1136/bmj.c2442 pmid:20466793. Collins GS, Altman DG. Predicting the 10 year risk of cardiovascular disease in the United Kingdom: independent and external validation of an updated version of QRISK2. BMJ2012;344:e4181. doi:10.1136/bmj.e4181 pmid:22723603. Hippisley-Cox J, Coupland C, Vinogradova Y, Robson J, Brindle P. Performance of the QRISK cardiovascular risk prediction algorithm in an independent UK sample of patients from general practice: a validation study. Heart2008;94:34-9. doi:10.1136/hrt.2007.134890 pmid:17916661. Riley RD, Ensor J, Snell KIE, et al. External validation of clinical prediction models using big datasets from e-health records or IPD meta-analysis: opportunities and challenges. BMJ2016;353:i3140. doi:10.1136/bmj.i3140 pmid:27334381. Morris RW, Cooper JA, Shah T, et al. UCLEB Consortium. Marginal role for 53 common genetic variants in cardiovascular disease prediction. Heart2016;102:1640-7. doi:10.1136/heartjnl-2016-309298 pmid:27365493. Tillin T, Hughes AD, Whincup P, et al. SABRE Study Group. Ethnicity and prediction of cardiovascular disease: performance of QRISK2 and Framingham scores in a U.K. tri-ethnic prospective cohort study (SABRE--Southall And Brent REvisited). Heart2014;100:60-7. doi:10.1136/heartjnl-2013-304474. pmid:24186564. Schofield P, Crichton N, Chen R. Methods for assessing cardiovascular disease risk in a UK black population. Heart2012;98:1373-7. doi:10.1136/heartjnl-2012-302168 pmid:22842990. Arts EEA, Popa C, Den Broeder AA, et al. Performance of four current risk algorithms in predicting cardiovascular events in patients with early rheumatoid arthritis. Ann Rheum Dis2015;74:668-74. doi:10.1136/annrheumdis-2013-204024 pmid:24389293. Pike MM, Decker PA, Larson NB, et al. Improvement in Cardiovascular Risk Prediction with Electronic Health Records. J Cardiovasc Transl Res2016;9:214-22. doi:10.1007/s12265-016-9687-z pmid:26960568. Robson J, Dostal I, Sheikh A, et al. The NHS Health Check in England: an evaluation of the first 4 years. BMJ Open2016;6:e008840. doi:10.1136/bmjopen-2015-008840 pmid:26762161. Crossan C, Lord J, Ryan R, et al. Cost effectiveness of case-finding strategies for primary prevention of cardiovascular disease: a modelling study. Br J Gen Pract2017;67:e67-77. doi:10.3399/bjgp16X687973 pmid:27821671. Dixon P, Hollinghurst S, Ara R, Edwards L, Foster A, Salisbury C. Cost-effectiveness modelling of telehealth for patients with raised cardiovascular disease risk: evidence from a cohort simulation conducted alongside the Healthlines randomised controlled trial. BMJ Open2016;6:e012355. doi:10.1136/bmjopen-2016-012355 pmid:27670521. Salisbury C, O’Cathain A, Thomas C, et al. Telehealth for patients at high risk of cardiovascular disease: pragmatic randomised controlled trial. BMJ2016;353:i2647. doi:10.1136/bmj.i2647 pmid:27252245. Excellence NIfC. Quality and outcomes framework (QOF) indicator guidance: primary prevention of cardiovascular disease London 2011. www.nice.org.uk/nicemedia/live/13520/55454/55454.pdf accessed 05.06.2013 2013. National Clinical Guideline Centre. Lipid modification: cardiovascular risk assessment and the modification of blood lipids for the primary and secondary prevention of cardiovascular disease.2014: 286. Department of Health. NHS Health Check: Vascular Risk Assessment and Management Best Practice Guidance. In: Department of Health, ed. London, 2009. Thompson IM, Tangen CM, Goodman PJ, Probstfield JL, Moinpour CM, Coltman CA. Erectile dysfunction and subsequent cardiovascular disease. JAMA2005;294:2996-3002. doi:10.1001/jama.294.23.2996 pmid:16414947. Vlachopoulos CV, Terentes-Printzios DG, Ioakeimidis NK, Aznaouridis KA, Stefanadis CI. Prediction of cardiovascular events and all-cause mortality with erectile dysfunction: a systematic review and meta-analysis of cohort studies. Circ Cardiovasc Qual Outcomes2013;6:99-109. doi:10.1161/CIRCOUTCOMES.112.966903 pmid:23300267. Shamloul R, Ghanem H. Erectile dysfunction. Lancet2013;381:153-65. doi:10.1016/S0140-6736(12)60520-0 pmid:23040455. Kurth T, Winter AC, Eliassen AH, et al. Migraine and risk of cardiovascular disease in women: prospective cohort study. BMJ2016;353:i2610. doi:10.1136/bmj.i2610 pmid:27247281. Rothwell PM, Howard SC, Dolan E, et al. Prognostic significance of visit-to-visit variability, maximum systolic blood pressure, and episodic hypertension. Lancet2010;375:895-905. doi:10.1016/S0140-6736(10)60308-X pmid:20226988. Hippisley-Cox J, Coupland C. Predicting risk of emergency admission to hospital using primary care data: derivation and validation of QAdmissions score. BMJ Open2013;3:e003482. doi:10.1136/bmjopen-2013-003482 pmid:23959760. Hippisley-Cox J, Coupland C, Vinogradova Y, et al. Predicting cardiovascular risk in England and Wales: prospective derivation and validation of QRISK2. BMJ2008;336:1475-82. doi:10.1136/bmj.39609.449676.25. pmid:18573856. Schafer JL, Graham JW. Missing data: our view of the state of the art. Psychol Methods2002;7:147-77. doi:10.1037/1082-989X.7.2.147 pmid:12090408. Group TAM. The Academic Medicine Group. Academic medicine: problems and solutions. BMJ1989;298:573-9. doi:10.1136/bmj.298.6673.573 pmid:2495121. Steyerberg EW, van Veen M. Imputation is beneficial for handling missing data in predictive models. J Clin Epidemiol2007;60:979. doi:10.1016/j.jclinepi.2007.03.003 pmid:17689816. Moons KGM, Donders RART, Stijnen T, Harrell FE Jr. Using the outcome for imputation of missing predictor values was preferred. J Clin Epidemiol2006;59:1092-101. doi:10.1016/j.jclinepi.2006.01.009 pmid:16980150. Schafer JL. Multiple imputation: a primer. Stat Methods Med Res1999;8:3-15. doi:10.1177/096228029900800102 pmid:10347857. Rubin DB. Multiple Imputation for Non-response in Surveys.John Wiley, 1987doi:10.1002/9780470316696. Royston P, Ambler G, Sauerbrei W. The use of fractional polynomials to model continuous risk variables in epidemiology. Int J Epidemiol1999;28:964-74. doi:10.1093/ije/28.5.964 pmid:10597998. Hosmer D, Lemeshow S. Applied Logistic Regression.John Wiley, 1989. Royston P. Explained variation for survival models. Stata J2006;6:1-14. Royston P, Sauerbrei W. A new measure of prognostic separation in survival data. Stat Med2004;23:723-48. doi:10.1002/sim.1621 pmid:14981672. Harrell FE Jr, , Lee KL, Mark DB. Multivariable prognostic models: issues in developing models, evaluating assumptions and adequacy, and measuring and reducing errors. Stat Med1996;15:361-87. doi:10.1002/(SICI)1097-0258(19960229)15:4<361::AID-SIM168>3.0.CO;2-4 pmid:8668867. Collins GS, Reitsma JB, Altman DG, Moons KG. Transparent Reporting of a multivariable prediction model for Individual Prognosis or Diagnosis (TRIPOD): the TRIPOD statement. Ann Intern Med2015;162:55-63. doi:10.7326/M14-0697 pmid:25560714. Burch RC, Rayhill ML. Migraine and vascular disease. BMJ2016;353:i2806. doi:10.1136/bmj.i2806 pmid:27247290. Kurth T, Gaziano JM, Cook NR, Logroscino G, Diener HC, Buring JE. Migraine and risk of cardiovascular disease in women. JAMA2006;296:283-91. doi:10.1001/jama.296.3.283 pmid:16849661. Schürks M, Rist PM, Bigal ME, Buring JE, Lipton RB, Kurth T. Migraine and cardiovascular disease: systematic review and meta-analysis. BMJ2009;339:b3914. doi:10.1136/bmj.b3914 pmid:19861375. Drici MD, Priori S. Cardiovascular risks of atypical antipsychotic drug treatment. Pharmacoepidemiol Drug Saf2007;16:882-90. doi:10.1002/pds.1424 pmid:17563919. Fardet L, Petersen I, Nazareth I. Risk of cardiovascular events in people prescribed glucocorticoids with iatrogenic Cushing’s syndrome: cohort study. BMJ2012;345:e4928. doi:10.1136/bmj.e4928. pmid:22846415. Varas-Lorenzo C, Rodriguez LA, Maguire A, Castellsague J, Perez-Gutthann S. Use of oral corticosteroids and the risk of acute myocardial infarction. Atherosclerosis2007;192:376-83. doi:10.1016/j.atherosclerosis.2006.05.019 pmid:16787647. Foguet-Boreu Q, Fernandez San Martin MI, Flores Mateo G, et al. Cardiovascular risk assessment in patients with a severe mental illness: a systematic review and meta-analysis. BMC Psychiatry2016;16:141. doi:10.1186/s12888-016-0833-6 pmid:27176477. McMahon M, Hahn BH, Skaggs BJ. Systemic lupus erythematosus and cardiovascular disease: prediction and potential for therapeutic intervention. Expert Rev Clin Immunol2011;7:227-41. doi:10.1586/eci.10.98 pmid:21426260. Go AS, Chertow GM, Fan D, McCulloch CE, Hsu CY. Chronic kidney disease and the risks of death, cardiovascular events, and hospitalization. N Engl J Med2004;351:1296-305. doi:10.1056/NEJMoa041031 pmid:15385656. Stevens SL, Wood S, Koshiaris C, et al. Blood pressure variability and cardiovascular disease: systematic review and meta-analysis. BMJ2016;354:i4098. doi:10.1136/bmj.i4098 pmid:27511067. Hata J, Arima H, Rothwell PM, et al. ADVANCE Collaborative Group. Effects of visit-to-visit variability in systolic blood pressure on macrovascular and microvascular complications in patients with type 2 diabetes mellitus: the ADVANCE trial. Circulation2013;128:1325-34. doi:10.1161/CIRCULATIONAHA.113.002717 pmid:23926207. Feinstein MJ. Cardiovascular disease risk assessment in HIV: navigating data-sparse zones. Heart2016;102:1157-8. doi:10.1136/heartjnl-2016-309752 pmid:27406719. Kingery JR, Alfred Y, Smart LR, et al. Short-term and long-term cardiovascular risk, metabolic syndrome and HIV in Tanzania. Heart2016;102:1200-5. doi:10.1136/heartjnl-2015-309026 pmid:27105648. Hippisley-Cox J, Coupland C, Robson J, Sheikh A, Brindle P. Predicting risk of type 2 diabetes in England and Wales: prospective derivation and validation of QDScore. BMJ2009;338:b880. doi:10.1136/bmj.b880. pmid:19297312. Hippisley-Cox J, Coupland C. Derivation and validation of updated QFracture algorithm to predict risk of osteoporotic fracture in primary care in the United Kingdom: prospective open cohort study. BMJ2012;344:e3427. doi:10.1136/bmj.e3427. pmid:22619194. Hippisley-Cox J, Coupland C. Predicting the risk of chronic Kidney Disease in men and women in England and Wales: prospective derivation and external validation of the QKidney Scores. BMC Fam Pract2010;11:49. doi:10.1186/1471-2296-11-49 pmid:20565929. Hippisley-Cox J, Coupland C. Development and validation of risk prediction algorithm (QThrombosis) to estimate future risk of venous thromboembolism: prospective cohort study. BMJ2011;343:d4656. doi:10.1136/bmj.d4656 pmid:21846713. Hippisley-Cox J, Coupland C. Predicting risk of osteoporotic fracture in men and women in England and Wales: prospective derivation and validation of QFractureScores. BMJ2009;339:b4229. doi:10.1136/bmj.b4229 pmid:19926696. Collins GS, Mallett S, Altman DG. Predicting risk of osteoporotic and hip fracture in the United Kingdom: prospective independent and external validation of QFractureScores. BMJ2011;342:d3651. doi:10.1136/bmj.d3651 pmid:21697214. Collins GS, Altman DG. External validation of QDSCORE(®) for predicting the 10-year risk of developing Type 2 diabetes. Diabet Med2011;28:599-607. doi:10.1111/j.1464-5491.2011.03237.x pmid:21480970. Majeed A. Sources, uses, strengths and limitations of data collected in primary care in England. Health Stat Q2004;(21):5-14.pmid:15615148.